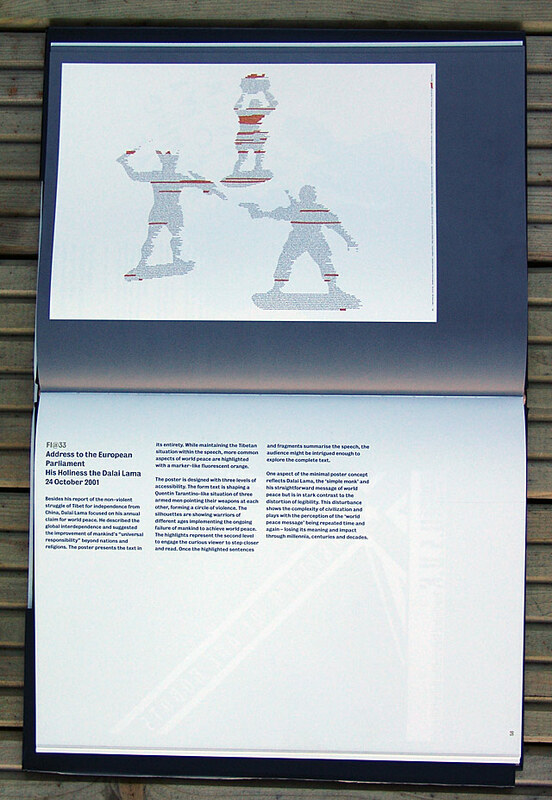 ___ The poster is designed with three levels of accessibility. The form text is shaping a Quentin Tarantino-like situation of three armed men pointing their weapons at each other, forming a circle of violence. The silhouettes are showing warriors of different ages implementing the ongoing failure of mankind to achieve world peace. The highlights represent the second level to engage the curious viewer to step closer and read. Once the highlighted sentences and fragments summarise the speech, the audience might be intrigued enough to explore the complete text. ___ One aspect of the minimal poster concept reflects Dalai Lama, the 'simple monk' and his straightforward message of world peace but is in stark contrast to the distortion of legibility. his disturbance shows the complexity of civilisation and plays with the perception of the 'world peace message' being repeated time and again – losing its meaning and impact through millennia, centuries and decades. See close-ups of the poster and pictures of the exhibitions in London and Berlin. Public Address System is a collection of posters by typographers that were featured in an exhibition of the same name in London and Berlin in 2004. 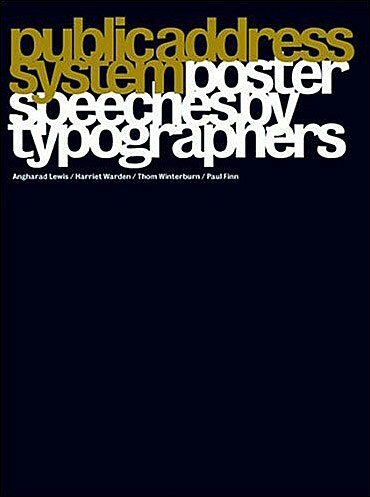 The brief was simple: to design an A2 poster that was a typographic interpretation of a speech. The typographers' responses are awe-inspiring and provoke deep thought about not only the issues addressed by the often famous speeches, but also about the very nature of speech, typography and posters. The featured works are made from all manner of materials, from Perspex, to gold foil, to a collage, including torn book pages and a 7-inch vinyl record. These highly innovative approaches to poster design endorse the importance of typography in visual culture and its power in everyday life; what emerged from the exhibition, above all else, was that far from being dry or retiring, typography arouses passion.